We performed new experiments on incorporation of hydrogen in olivine at high pressures (2-12 GPa) and temperatures (1000-1300°C). OH concentrations were calculated using the Bell et al. 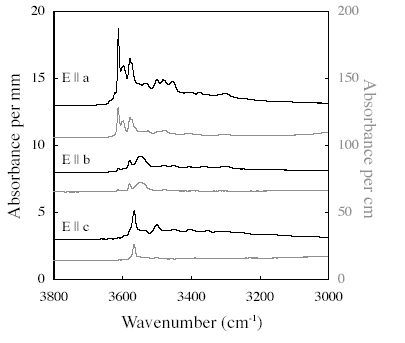 (2003) calibration applied to principal-axis infrared absorption spectra synthesized from polarized measurements on randomly oriented grains. Starting materials for the experiments included both fine-grained powders and larger single crystals. Hydrogen was incorporated during grain growth in the former case and by volume diffusion in the latter. The spectra of Fe-bearing olivines exhibit similar structure regardless of the starting material, and are dominated by bands in the wavenumber range from about 3500 to 3650 cm-1. We do not observe bands near 3525 and 3573 cm-1, which are predominant in many natural olivines as well as olivines annealed in experiments at lower pressures and are attributed to humite-related defects. Furthermore, bands between 3300 and 3400 cm-1, attributed to high silica activity or high oxygen fugacity, are weak or non-existent. Our measurements indicate that OH solubility in Fe-bearing olivine is 2.5-4 times higher than that measured by Kohlstedt et al. (1996). Although this is largely due to the use of a new calibration in our study, correction of previous values is not straightforward. In the pure Mg-system, in contrast to Fe-bearing olivine, order-of- magnitude apparent differences in OH solubility can be obtained using different experimental procedures. This raises questions about attainment of equilibrium in experimental studies of hydrogen incorporation in nominally anhydrous minerals, particularly when crystals are grown from a hydrous melt. Figure 8. Comparison among IR calibrations applied to our experimental samples. Filled and unfilled circles are for polarized and unpolarized IR spectra, respectively. Spectra were calculated as discussed in the text. Regression lines constrained to pass through the origin indicate that the Bell et al. 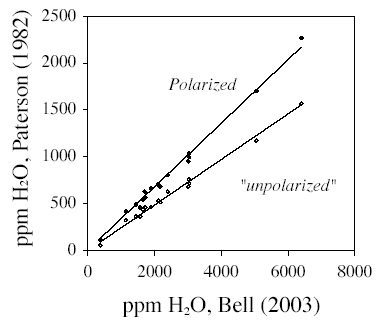 (2003) calibration gives 2.95 or 4.12 times the amount of the Paterson (1982) calibration for polarized and unpolarized radiation, respectively.